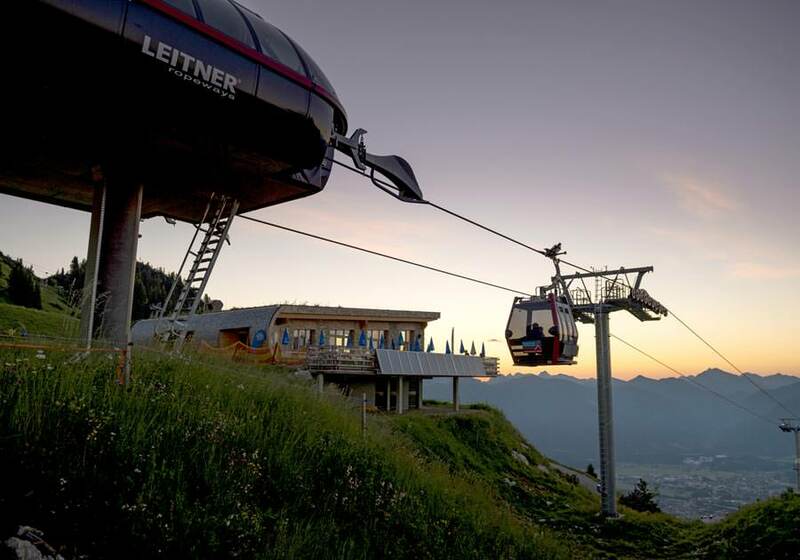 The Reutten cableway established a new feeder transport (8er EUB) in 2010 with a stopover into the high-alpine ski region Höfener Alm / Hahnenkamm. The stopover at „Alpeggle“ is situated in a way, so that even inexperienced skiers may make use of the high-alpine ski region without problems. In turn, several trail corrections are done. In direct vicinity of the mountain station of the Hahnenkamm line Höfen, there is a panorama restaurant with about 80 seats inside and about 150 seats on the terrace. The Shollenwiesenlift in the valley is for everyone who doesn't want to go quite as high, and there's the Ski School Lift for advanced skiers. Both ski schools guarantee thoroughly trained winter sport instructors for the ideal learning success! Cool trails and rustic lodges provide excellent skiing fun, and after that you just go to the Après Ski at the valley-station. In summer the high alpine hiking area Reutten Cableway Hahnenkamm is ideal for younger and older visitors to undertake easy to medium-hard hikes. Simple cuisine and homemade pie in the alms & lodges conclude a good hiking day. The bare-foot hiking trail with 15 stations to relax is a special experience for a lot of fun for the whole family.